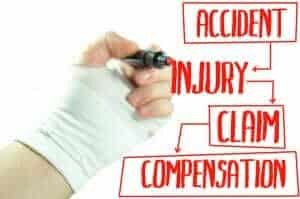 Every personal injury case is different, although there are some common elements in the claims process. 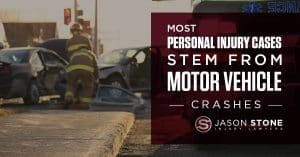 Most injury cases stem from motor vehicle crashes, in which driver negligence contributes to a collision that results in injuries. For the purpose of providing an overview of the personal injury legal process in Massachusetts, we’ll use car accidents as an example. If you were hurt due to another person’s carelessness, please call Jason Stone Injury Lawyers at 800-577-5188 or contact us online. Our Boston attorneys offer free consultations to help you understand your options, and we work hard to recover the financial security injury victims need. Massachusetts maintains a no-fault system, in which injured motorists deal directly with their insurance providers to pay for medical expenses and property damage, rather than pursuing compensation from a third party, which in other states is usually the at-fault driver’s insurance company. Under Massachusetts’ no-fault structure, injury victims can’t seek damages from the at-fault party and his or her insurance provider unless the injuries meet specific criteria. The no-fault policy has advantages if you have relatively minor injuries and property damage. But for those who suffer severe injuries are often left facing extreme financial burdens when coverage limits are exhausted. This is where fault and personal injury claims come into play. The amount of money an insurer is obligated to pay is partly determined by fault. If an injured driver is more than 50 percent at fault for the crash, that driver’s insurance provider is responsible for the damages of all involved in the accident. However, if multiple parties share liability and no single driver is more than 50 percent at fault, each driver’s insurer is only obligated to cover other injured individuals to the extent that they did not contribute to the wreck; this is known as modified comparative negligence. Massachusetts law pertaining to motor vehicle liability policies includes a so-called “Standards of Fault”, which allow insurers to presume fault for certain crashes. For instance, if a driver crosses traffic lanes and hits a vehicle traveling in the opposite direction, the driver’s insurance company may assume liability. When Standards of Fault is used by insurers, the insurance company will notify the at-fault driver by mail. Following an accident, motorists who suffer injuries or sustain property damage need to file a claim with their insurance provider. The insurer will either deny the claim or send a settlement check. If the claim is denied, or if the driver believes he or she is not more than 50 percent at fault for the accident, the decision can be appealed. If an appeal is unsuccessful, the claim can be reported to the Massachusetts Division of Insurance, who will investigate the insurer. There is also an opportunity to negotiate the settlement amount. Crash victims are not obligated to accept the settlement offered by their insurer. If another driver caused the injury or the insurer refuses coverage, it’s advisable to contact a knowledgeable personal injury lawyer. Injury victims have three years from the date the injuries occurred to file a lawsuit seeking damages in Massachusetts. Litigation may be necessary to recover fair compensation for medical costs, lost earnings, and other damages. In many cases, a personal injury attorney can negotiate a just settlement without the victim having to appear in court. Some injury victims accept unfair insurance company settlement offers because they think they can’t afford an attorney. 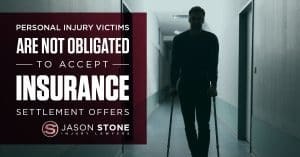 At Jason Stone Injury Lawyers, we offer the Stone Cold Guarantee®, which includes our pledge that our attorneys don’t get paid unless you get paid. To schedule your free, no-obligation consultation, please call us today at 800-577-5188 or contact one of our Boston-area offices. For ongoing information about legal issues in Boston and across Massachusetts, follow Jason Stone Injury Lawyers on Twitter or “like” us on Facebook.